Bernie Goldbach in Cashel | My photo of a Bake House scone. I ENCOURAGE people visiting Ireland to try a different Irish scone every morning mainly because Irish flour differs from American flour. I listen to Caítríona, an Irish food and parenting blogger, describe how she cleverly sources and astutely makes food and after a solid year of her podcasts, I yearn to attend a day-long seminar on "Irish Ethnic Baking" where secrets of the scone get discussed. I've discovered some already during scone-baking sessions with Busy Bees. The best sessions are the messiest. Here are some secrets I've uncovered. -- Irish brown flour is much weaker (lower in gluten) than American whole-wheat flour and that works wonders for the delicate texture of Irish brown bread and for pastry but is not so good for yeast breads. -- Odlum's soda bread mix helps bread chefs get the texture right more consistently than mixes up flours in magic proportions. -- I watched young Mia make a perfect scone by working the fat into the flour with her fingers until it formed cornmeal-like crumbs. Then she asked me to knead the dough. 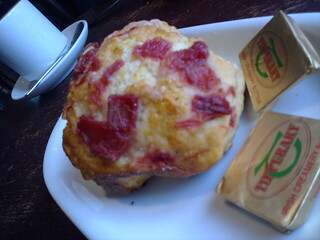 -- I like scones with a light taste. Those scones that taste lighter norare made with shortening and very wet dough. Am I cheating if I use olive oil and add an egg to the mix? The extra viscosity certainly makes the job easier. -- FACT: Buttermilk is on Irish supermarket shelves to make better baked products. -- Our oven needs to be preheated to 275C then run at 220C during baking. -- During the past 15 years of taste-testing Irish scones, I've developed a personal liking for scones made with a ratio of 1 1/4 cups of white flour to 1 cup of pastry flour. I get my pastry flour from Superquinn. -- The lightest scones Mia has made resulted after she sifted the flour mixture five times. I wish my favourite coffee morning haunts would share their scone recipes because I think they would discover people like me would seek them out as regular stops in their weekly routines. Previously -- "Learned at Camp Bread" on Irish Typepad, August 27, 2007. Bonus Link: Wholesome Ireland scones. Bernie Goldbach is a creative multimedia lecturer who believes one element of the Tipperary Multimedia Hub should feature freshly baked products--every day in the incubation centre.